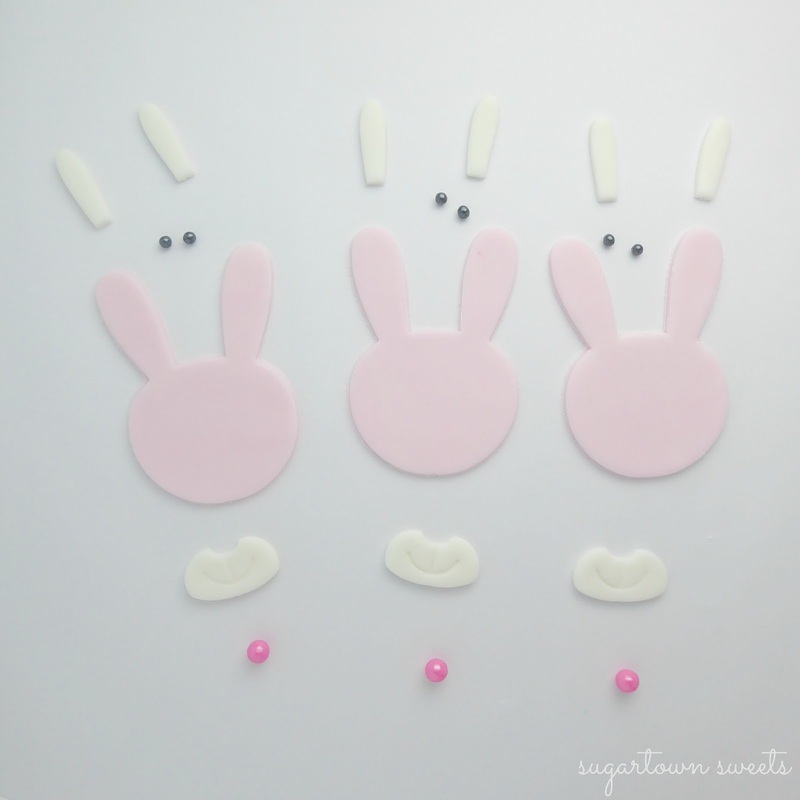 These sweet little bunnies would like to wish you a Happy Easter..if you can find them that is!! Or you can just make some yourself with the kiddos! 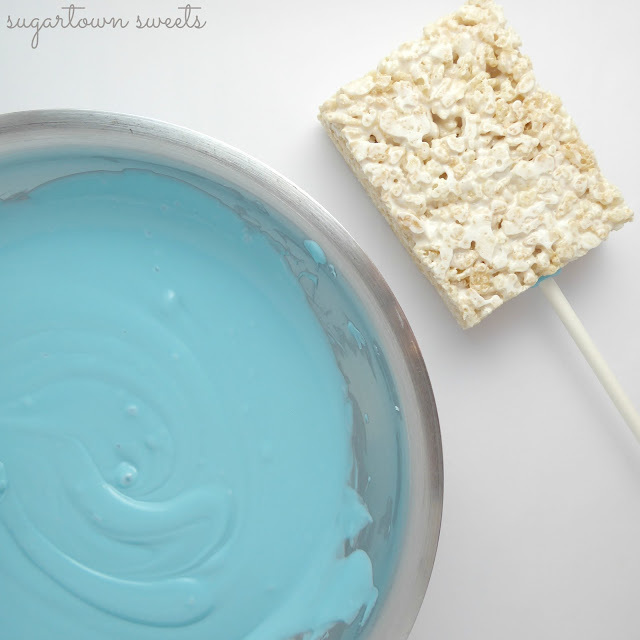 Either way you're in for a treat, a Rice Krispies treat! 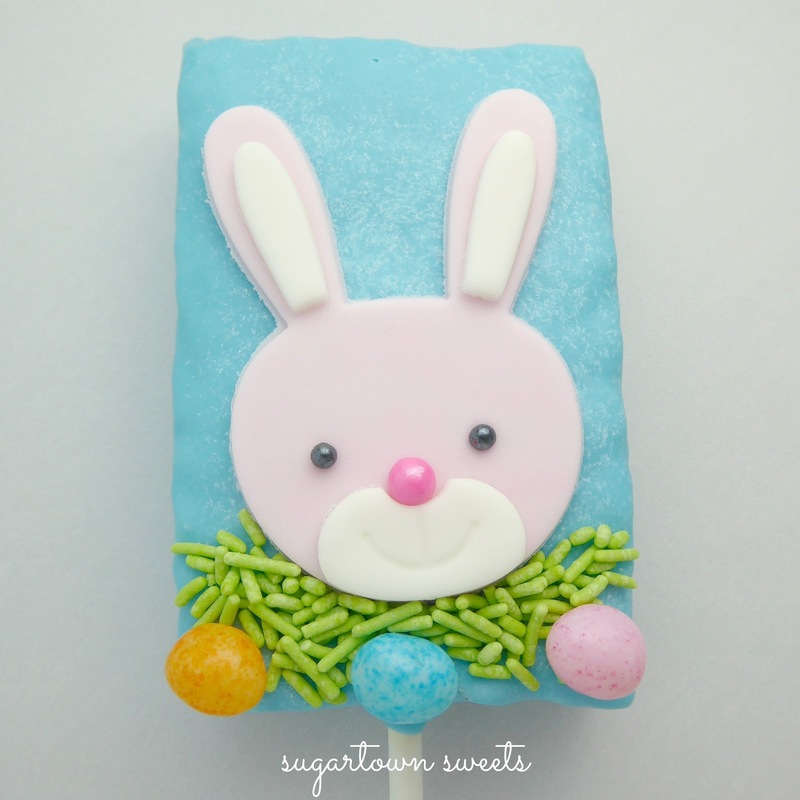 I made my own cereal treats because the ones I bought at the store were just way too small for my sunny bunnies. I used the recipe on the back of the cereal box. 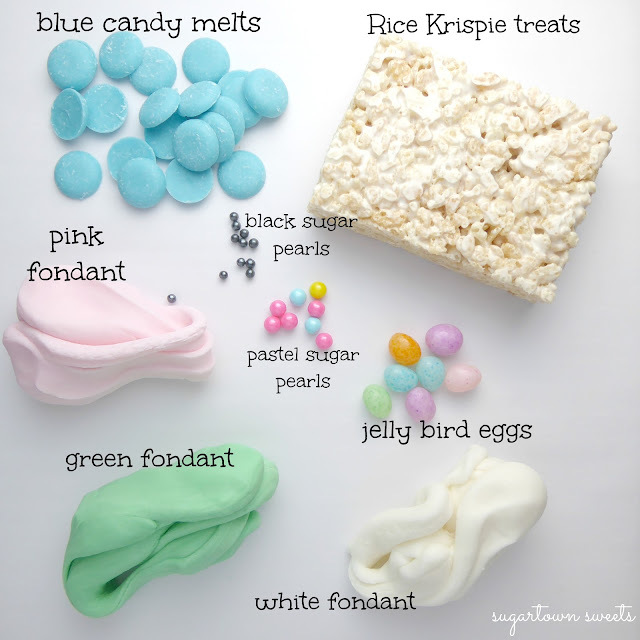 I also used pink, green, and white fondant, blue candy melts, black sugar pearls, pastel candy pearls, and jelly bean bird eggs. 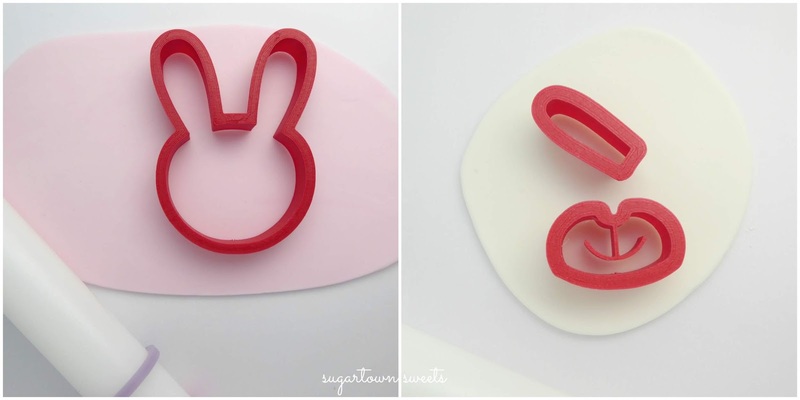 I had this "bunny in the grass" idea floating around in my head but I needed the perfect cutters and I found them both here at JB Cookie Cutters! 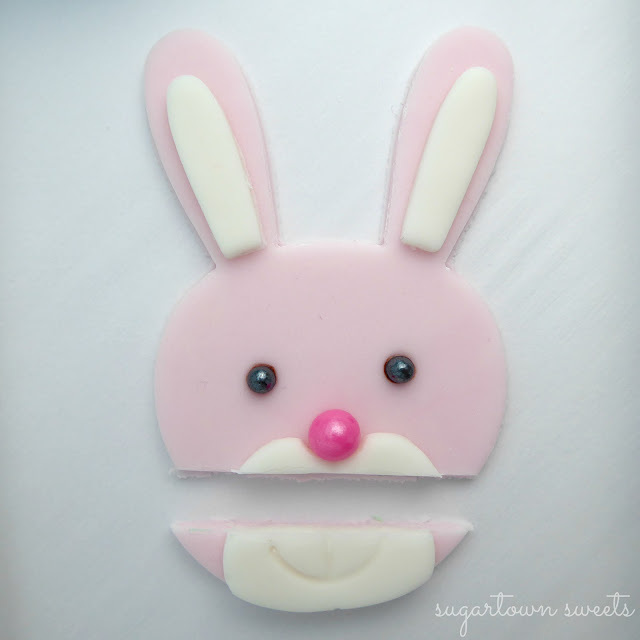 Click on the link for the bunny face cutter, and here for the grass cutter. 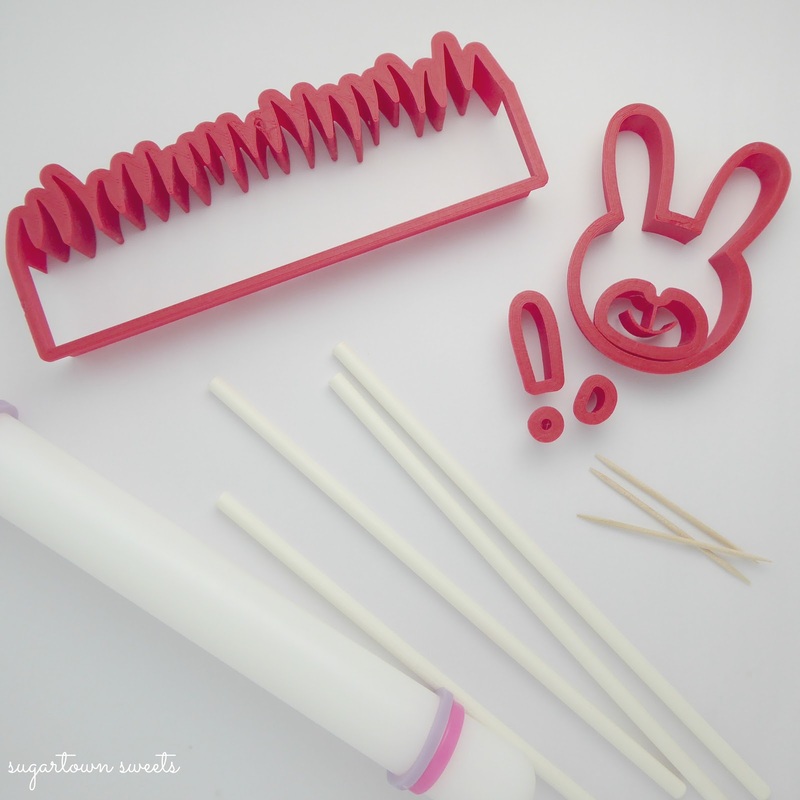 I used cookie sticks for my treats and toothpicks to gently remove the fondant from the smaller cutters. 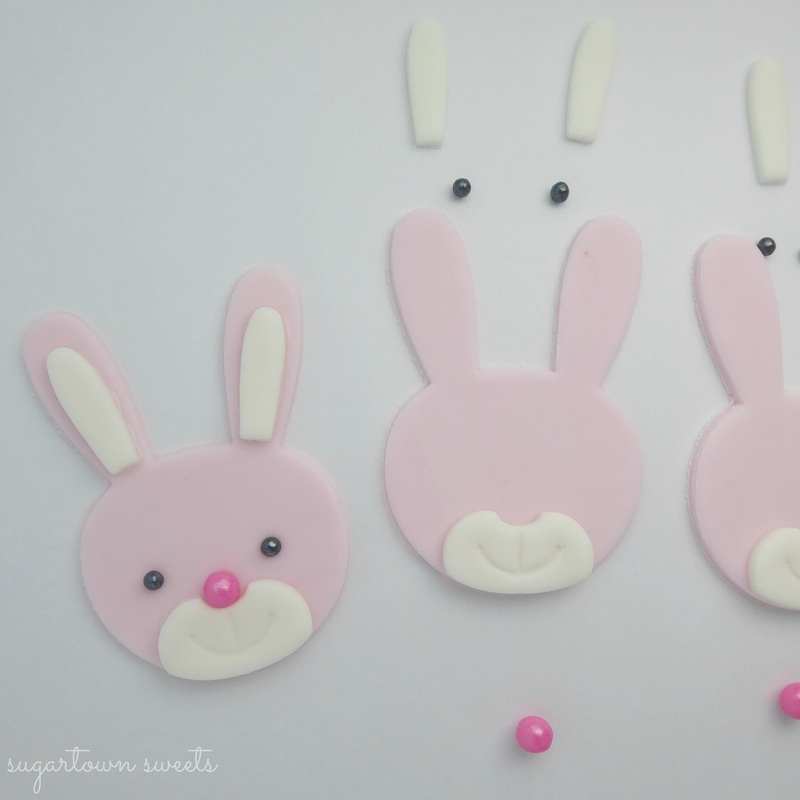 Let's make some bunny faces! Roll out fondant and if needed use a little confectioner's sugar on the cutters to prevent sticking. 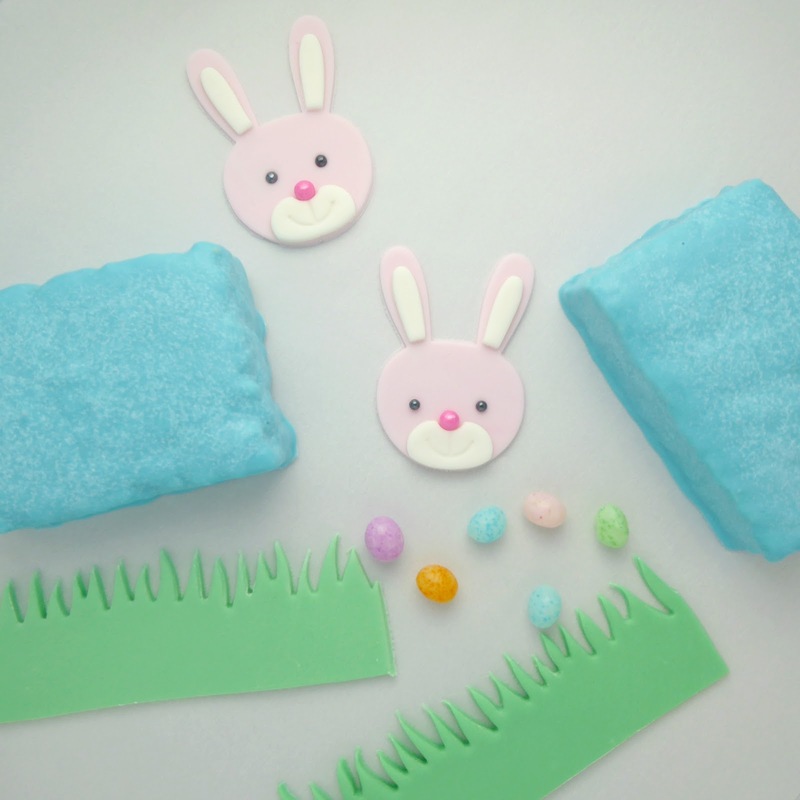 I used the ear and mouth cutters. I didn't use the eye or nose cutters as I'm using the candy pearls for those instead. The bunnies were easy to assemble using a food safe paintbrush. 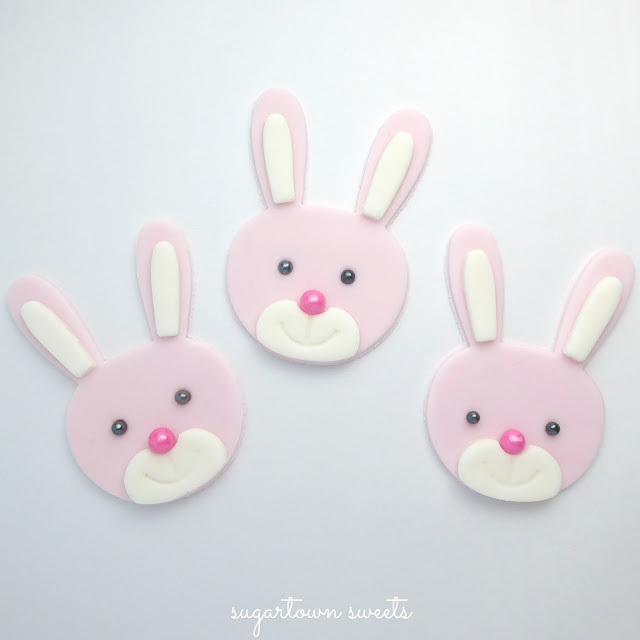 Just dab a little water to attach the fondant pieces. Gently press the eyes and nose into the face. You can also use a teeny dab of corn syrup to make sure they don't fall out! 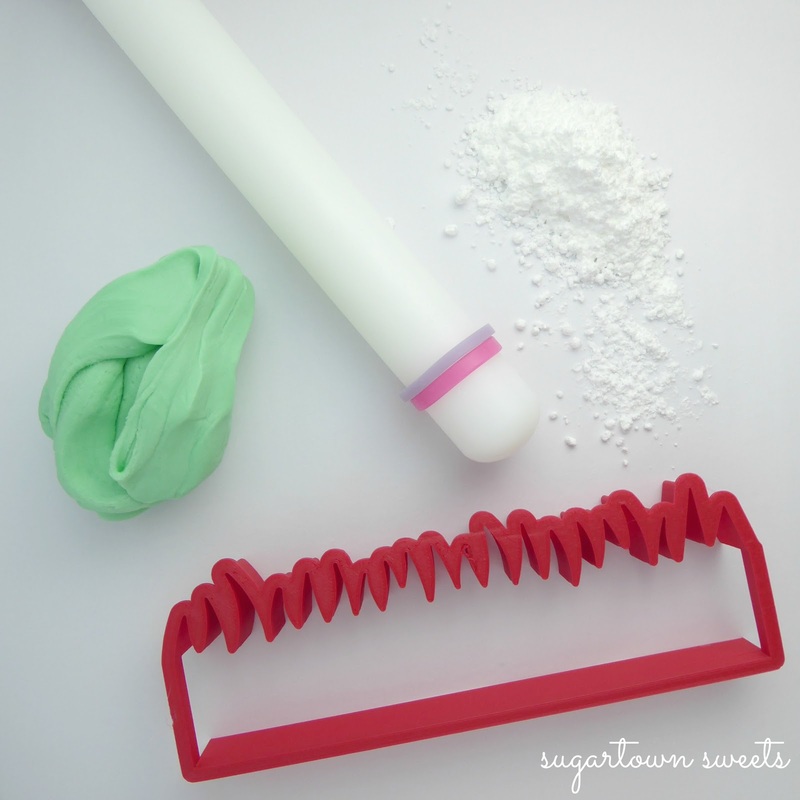 Swish cutter around in powdered sugar and press into fondant to cut through. Just one cut and you get two rows of fresh cut grass! 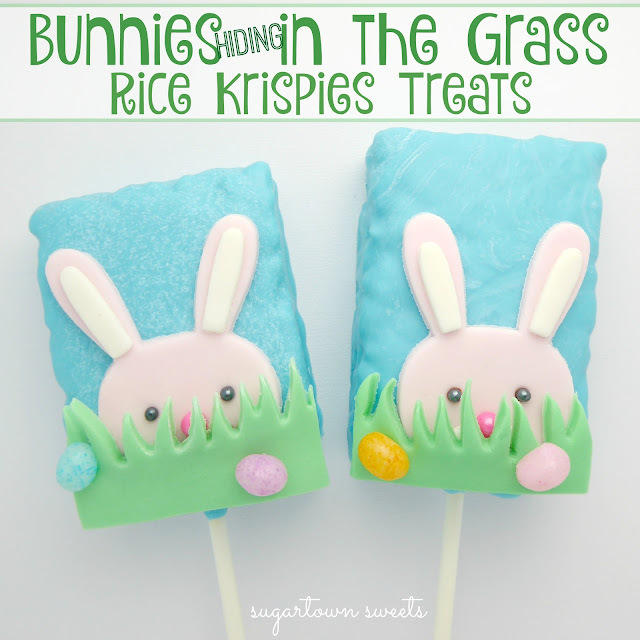 Cut a piece of grass the same width as your Rice Krispies treat to fit. Dip rice krispies treats in melted candy to coat. 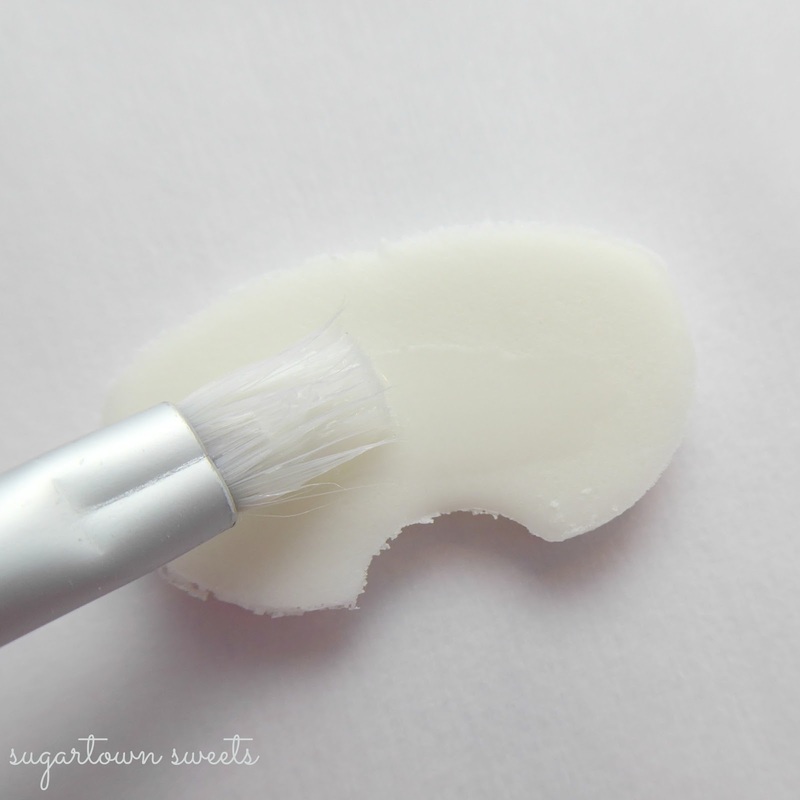 I also like to dip the end of cookie stick in melted candy before inserting into treat for a sturdier hold. 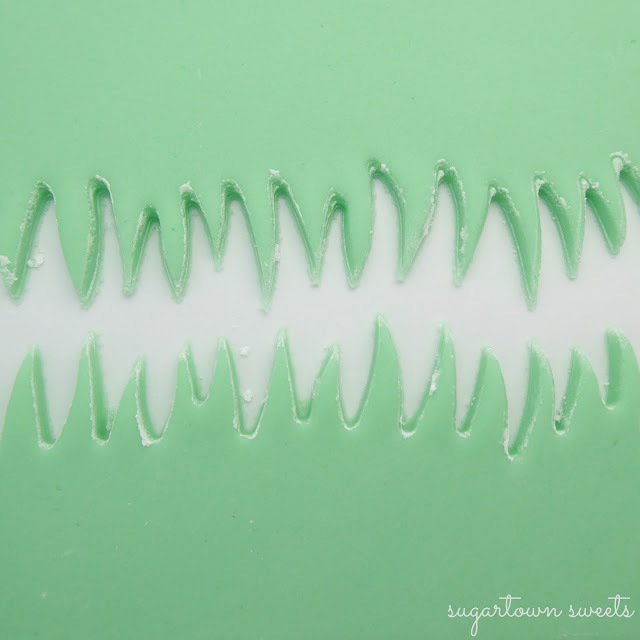 Welcome to Sugartown Sweets Candy Factory! 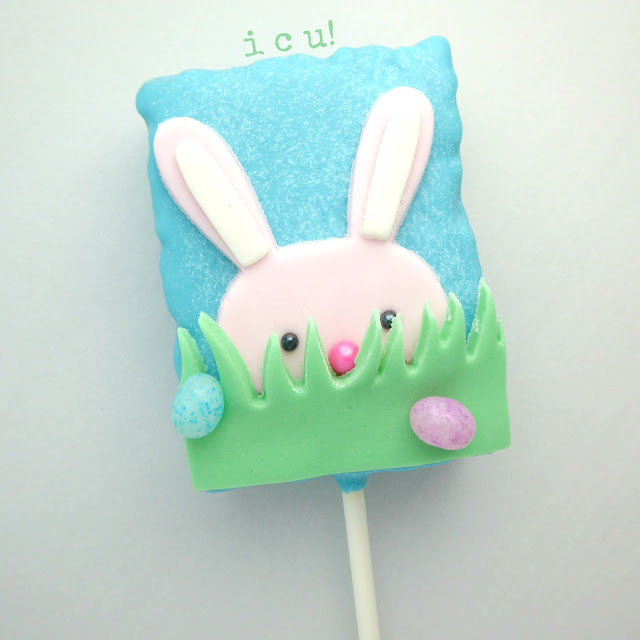 To each RKT attach bunnies, grass, and jelly beans with a little melted candy. I made this one with green sprinkles and left the face intact. For the hiding bunnies I cut off the lower portion of the face so they wouldn't be too bulky with the grass. I'm sorry little guy! So easy and fun and now we're done! Be still my heart he's so adorable! These are so darn cute. 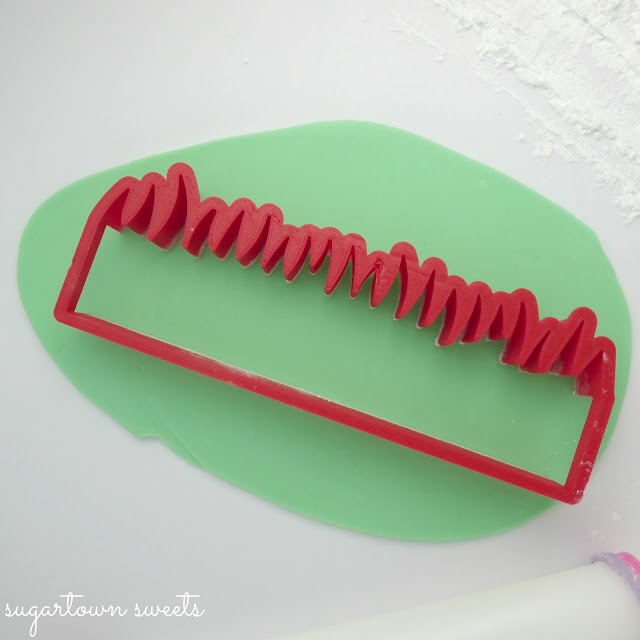 It's so fun how you used the cutters to create these treats.